At the Top of Squirrel Spur: Friends...Old and New! It has been a wonderful couple of weeks...occasionally frantic but always fun...typical October. The lovely thing about this October has been meeting some great people that I've known online, as well as reconnecting with wonderful old friends. 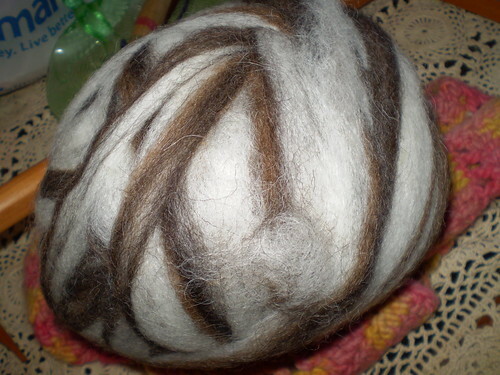 Spinwych is someone I've "met" in various handspinning forums through the years. She was here from Central Victoria (that's in Australia, y'all) visiting friends and it was lovely to finally see her in person. Apparently from the web site I found for her she's now into photography and she has a fantastic eye. I'll be excited to see what kind of photos she posts of her trip to America and the Blue Ridge Mountains! Also this past week or so a bunch of Facebook folk came in to visit and I was thrilled to see them. Some are like family, really, with close family connections to Meadows of Dan. Others are just great people I've come to know online in various ways. It's always fun to put a face to a name, though! And I almost forgot to mention one of the best "old friends" that I met in person this weekend. Lynn of Rocky Creek Scottie Adventures came to visit! For some reason, mainly because I've been seeing her comment on Tammy's blog for quite awhile, I thought she was living in North Carolina. But she lives nearer me and she and Tammy are planning to meet here next Thursday. So if anyone is wanting to visit with blogger/knitter/spinners come join us! it was really fun to talk to Lynn and I look forward to seeing her again! It's called a mystery batt because it's not the same all the way through. 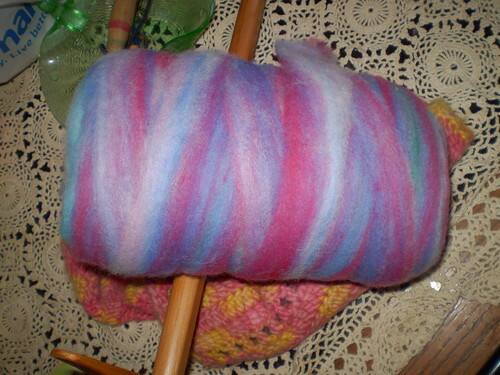 I'm really looking forward to spinning it, and thinking I might ply it with something else. This is a really cool idea! While Chris was here we did a lot of talking, as I said, and had fun trying out all the restaurants around. Our first stop was in Meadows of Dan at the new Two By Two BBQ. They just opened last week, just in time for Chris to visit, and we told them she came all the way down here just to come to their place. The food and service were great and we really enjoyed the way they're fixing up the place. Nice red checked tablecloths and they're putting together a bluegrass music theme with photographs of bands they know from festivals. We also visited Tuggles Gap Restaurant up the Blue Ridge Parkway and had a nice evening there. Good food and we sat knitting in public, which attracted the attention of another knitter that was visiting the area. She came into the shop the next day and we had a nice chat. On Sunday evening after Chris got back from SAFF we headed to Stuart for dinner with friend Linda. The two of them kept me in stitches (besides knitted ones) and we may not be welcome back to the Mexican restaurant there on Main Street! It was lonesome to see Chris leave on Monday morning. But I pulled myself together and tackled all the stuff that has needed doing this week. Chris brought back some lovely yarns from Avillion Farm and Red Gate Farm for the shop, and I've been putting them up on the shop shelves and admiring some talented spinning and color work! I also spent most of this morning stocking some lovely roving from a farm up in the Buffalo that features some of the most gorgeous Jacob I ever saw, along with some beautiful Romney and some merino/Rambouillet. 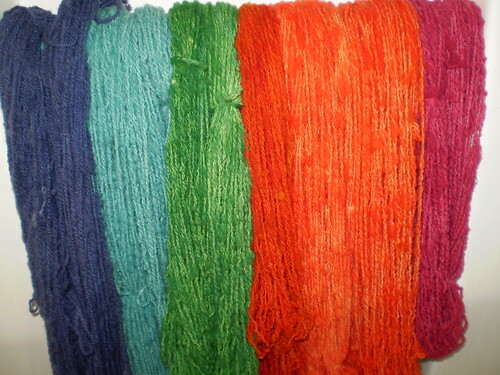 And I hit the dye pots quickly on Wednesday, although at the time I wasn't sure I was going to get the yarn done in time. This was some coarser roving I had made up just for projects like this. My usual spinning doesn't generally qualify as hat yarn. I was pleased with how this turned out, though, and Jane from Fiber on the Mountain is going to be knitting the hats before long. And so to treat myself after finishing the dreaded hat yarn roving, I started spinning this variegated roving from Black Hills Woolies. 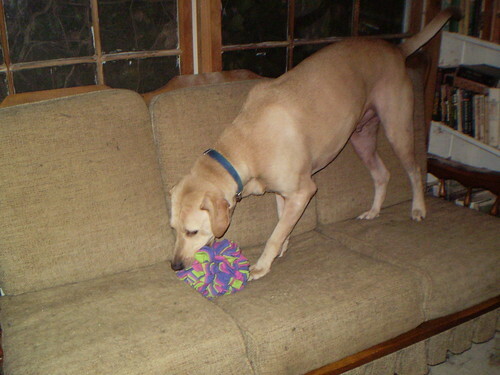 I bought the roving when we were in Colorado at the Estes Park Wool Market. My original intention was to spindle-spin this, but I haven't been making much progress on spindling lately! I have made progress on the Seine Scarf, though...see the last post for pictures. 45 inches long and counting! Thanks to Natalie, I've was intrigued about podcasts beyond our own. I went out and bought a little mp3 player, an adventure in itself. I had one before, but realized I never listened to music unless I was in the car. I didn't know anything about podcasts back then. Now that I want to listen to them, I had no idea where the cheap player I had wound up. It didn't work very well anyway. I went out searching for a player and would up with an RCA gadget named "Opal". Seriously. That's what it says, anyway. After a bit of fiddling around to figure out how to download these wonderful knitting talkers, I've been really enjoying my morning knitting sessions. Check out my review of my current favorite podcast, Brass Needles. 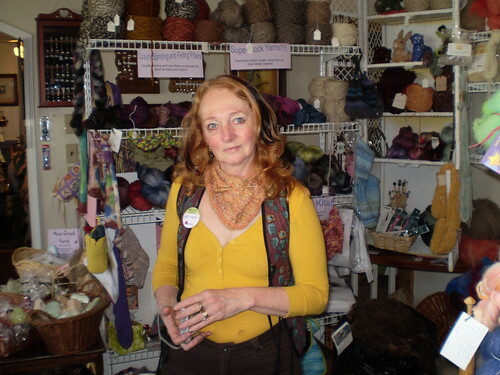 I've also posted a review of the new Interweave Knits Holiday Gifts 2009 issue. Tonight I'm supposed to be helping with the Haunted Corn Maze, so I've spent the day in striped stockings and a black dress. Only a couple of people have looked at me like I'm a bit weird. Not sure if that is good news or not!